So I’m looking for a job. Happily, this isn’t the first time I’ve undergone this process. And so, as I go about all the endless networking and cover-letter writing that job-hunting demands, I realize that I’ve learned a few tricks along the way that have helped me execute my search efficiently. 1. Cast a wide net. When people ask me for advice on changing careers, I always tell them to spend a lot of time thinking about what they want to do next before plunging into the job search. That said, you don’t want to be too narrow, especially in this economy. Rather, you want to have a fairly solid area of focus, with one or two related sub-fields. In my case, for example, I’m focusing mostly on non-profits that work with youth and journalism and/or creative writing. But I’m also looking at foundations, start-ups, media outfits, universities and consultancies, some of which focus on youth and/or writing and some of which don’t. 2. Organizations matter more than jobs. In keeping with #1, I also believe that if you find an organization whose mission you really endorse and a job there that more or less fits the bill, go for it. If you really like what they’re doing, and you can get your foot in the door, you can always work your way up to the job that you really want. This is a no-brainer for young people who have nothing to lose. It’s a bit trickier when you get older and money and seniority start to matter more. (See below.) But assuming that a given job is at a reasonable level of seniority for your age and experience, by all means take a pay or status cut if it means going somewhere you can believe in and imagine yourself staying. Long-term happiness is worth more than a few bucks. 3. Colleagues matter too. This is one of the most important lessons I’ve learned over the years, and one that’s also backed up by research. You can have the best, most seemingly-perfect job in the world. But if you find yourself eating your tuna-fish sandwich alone at your desk every day for lunch, it won’t matter one bit. In my own case, one of the driest jobs I ever had in terms of substance – (we sat around evaluating lending documents all day long) – was also one of the most fun. We constantly held office parties, played practical jokes on one another and basically laughed ourselves silly through each and every day. It almost didn’t matter what we were doing. I was reminded of this the other night around 11 p.m. when I was staring at a job application that was due in one hour’s time, debating whether or not I should bother to apply. It wasn’t quite what I was looking for, and I was leaning against, until I clicked onto the “bio” page of the staff members – and found myself not only impressed by their credentials, but actually smiling at the way they presented themselves. And the more I looked at the website, the more I thought to myself, “Gosh, it would be fun to work here.” Whenever you get that feeling, hit send. 4. Money isn’t irrelevant. OK. So I just said that money doesn’t matter as much as finding a place that matters. And that’s true, within reason. But you also have to factor in other things…like life. I’m in a mode, as I’ve said before, where I really want to give back. The problem with jobs that “give back” (in case you haven’t gotten that memo) is that they generally pay pretty poorly. Oh yeah. And we’re also trying to buy a flat. In London. (Insert laugh track.) So I can’t afford to take a job that pays peanuts. Which doesn’t mean that I feel like I need to march down to The City (London’s version of Wall St.) and take the next available position at Barclay’s. But I can’t entirely ignore economics either. As a wise friend of mine counseled me recently when I told her that jobs in one sector I was looking at paid double what jobs in another sector did: “Take the higher paying job. You’ll feel better about yourself. Trust me.” I’ve been pondering this ever since. 5. Don’t forget politics. The very first time I ever looked for a job I was 23-years old. I had just returned from a year traveling and studying in Central America, and was living in Washington, D.C. I was hoping to get a job with a think tank working on Latin American politics. The first place that called me in for an informational interview was a Center-right research policy research center where I knew someone who knew someone. After plying me with questions, their senior Latin Americanist sat back in her chair and looked me squarely in the eyes. “Look, don’t take this the wrong way. But you seem like a nice person and I’m going to give you a piece of advice. In this town,” she said, gesturing with both hands to indicate the sweep of the Capitol city. “It’s important to feel comfortable. So wherever you end up working, just be sure you feel comfortable.” Pause. “Ideologically.” I never saw that lady again. But I’ve never forgotten those words. Nor should you. 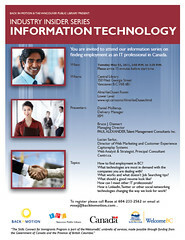 Industry Insider Series – Information Technology Events, Vancouver by Lucien Savluc via Flickr under a Creative Commons license. I think your Tip #5 is extraordinarily important, and something we too often neglect to consider – rather like in marriage. Compatible ideologies (or politics) matter. That said, for many of us in this economy, it’s all about the paycheck, and that’s the ultimate bottom line. These were all great. I’ve been on a long-distance walk for a month and want to read your older posts that I missed, but can’t find where the archives are. Please let me know! Thanks Louisa-See drop down “Categories” bar on RHS. They are organized by subject area. Thanks for dropping by! I’m confident you’ll know it when you see it — then all you have to do is get the “know-it’s-me” spot.